Part One of our first Richland Roots profile on Mansfield native Lloyd Garrison Wheeler can be accessed here. When Lloyd and Ranie Wheeler made their move to from Illinois to Arkansas in 1870, they had good timing. Just one year later, 3.3 square miles of the central part of Chicago were destroyed by fire. 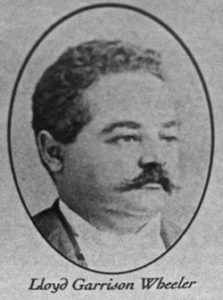 On the other hand, Reconstruction-era Arkansas was a very difficult location for Wheeler as he set out to establish a law practice. Family legend says that a billy club found within his effects after his death was protection in case he might become the target of Ku Klux Klan activity. Immediately, Wheeler became a part of the Pulaski County (Little Rock) legal and political community, being elected as county attorney in 1871 and then re-elected in 1872. When the Reconstruction government lost control, however, the Wheelers quickly returned to Illinois. The next two decades saw Lloyd Wheeler achieve a position of civic leadership and community betterment. This involvement included serving as an officer in the state militia, sponsoring the creation of one of the city’s leading literary societies, teaching philosophy, and then serving as one of the founders of the new Provident Hospital and Nurse Training School, the first African-American owned and operated hospital in the country – an institution which survives to this day as the Provident Hospital of Cook County. During Wheeler’s years as a member of the hospital’s Board of Trustees, including as Board President, Provident Hospital was the site of the first open heart surgery in American history. Performed without modern medical instruments, X-rays, or antibiotics, the surgery was a success with the patient leaving the hospital 51 days later. In 1969, the Cook County Bar Association held a service to celebrate the centennial of Lloyd Garrison Wheeler’s admission to the bar. Wheeler’s descendants have gone on to enjoy their own storied careers. 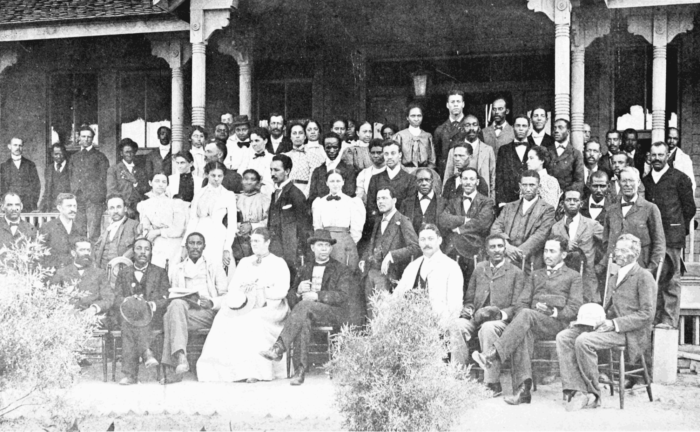 The photo above shows the faculty of the Tuskegee Institute about 1899, shortly before Wheeler’s arrival. Booker T. Washington sits in the middle of the front row.